Not all blog owners understand the connection between page / post import, and spam limitation. We see the occasional question, in Blogger Help Forum: Get Help with an Issue, about page / post import, and daily publishing limits. Why I can not import content, to my blogs? Note that "Automatically publish" is selected, in the blog discussed here. I've suggested a few times that use of "Automatically publish all imported posts and pages" is a bad idea, when importing many blogs - because it abuses the computer and home Internet connection. Here, we see another reason for not using "Automatically publish". 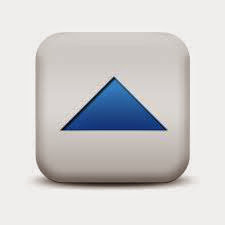 Import, with "Automatically publish", will exceed the daily publishing volume. Blogger limits daily posting volume. Any blog with more than 40 - 50 pages / posts, when it is exported then imported, will be a problem - if "Automatically publish" is selected during "Import". "Sorry, you have exceeded the maximum number of entries." If you import, and publish as you import, you will exceed the daily publishing limit. Your import will fail - because you are publishing more than the daily limit. Without a daily limit, spammers could flood post their blogs. If this limit was not in place, spammers could flood their blogs with pages and posts, by simply creating multiple blogs with multiple pages / posts, export from each blog, then import to other blogs - and publish while importing. 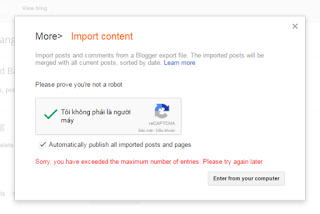 If Blogger is to control spam, they have to limit page / post publishing. With the daily limit of 50 pages and posts / 24 hours, that is slightly more than 1 page or post every 1/2 hour - allowing for no sleep, or other non blogging activity. People have to be encouraged to do something, besides publish - or how do you get material, for the blog? If people are going to publish a blog - and do other things besides publish a blog - there has to be a daily limit. Genuine blog owners have to not spend all their time publishing their blogs. Blog owners need to be encouraged to publish blogs with informative, interesting, and original content - so people will read the blogs, and search engines will index the blogs. Automated blog content, a favourite way of "bulking up" a blog with spam, has to be discouraged, to give genuine blog owners a chance. Without a daily limit, people who publish blogs with personal content would be at a disadvantage to spammers who publish pages and posts with automated content. Using Import, with no limits, would be an excellent way to publish spam in a never ending daily activity. Use "Import & back up" in 3 steps, to avoid the limit block. Export pages and posts, from one blog. Import pages and posts, to a second blog. Publish imported pages and posts, at a limited rate, selectively. That is the best way for genuine blog owners, to use the Export / Import ("Import & back up") option. #Blogger has a daily page / post publishing limit, to encourage blog owners to publish blogs with informative, interesting, and original content. Automated page / post publishing is allowed - but subject to a daily limit. Without a daily limit, spammers would abuse the Blogger infrastructure, with mass produced and scraped content - and Blogger would become one more spam haven. Blogger Magic - Using "Add a Gadget"
Don't Always Blame Blogger, With Your Blog Down! Dynamic Templates, And Improved "Follow by Email"
Wording The Blog Title And URL - Same or Unique?